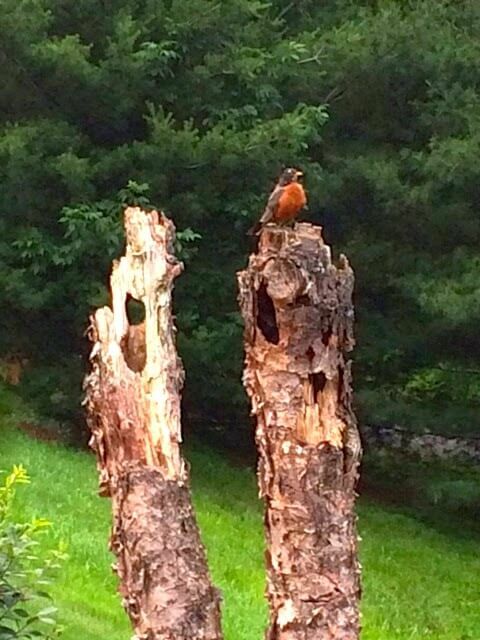 While relaxing and enjoying God’s beautiful creation the other day, I happened to notice some little birds pop in and out of a hole in an old dead tree stump. I was fascinated as I watched them flit here and there, constantly returning to this hidden place that I had not noticed before. The hole was so small that a predator would not be able to enter and their brown bodies blended in with the rough bark, making it a perfect place for them to live in safety. What a refuge for these otherwise helpless little creatures. We also need a safe place of protection from the evil and difficulties of this world. God promises to be that place of strength that we can run to. When we are abiding in Him we do not need to fear. Though the earth might shift and change, though the mountains slip into the heart of the sea, though the mighty waters roar and foam, we can be safe and secure in the midst of our troubles. There is no physical danger, no emotional upheaval, no health predicament in which we will be left alone unguarded. The evil one may try to tempt us to doubt and fear. But if we stay hidden away in Christ, relying on Him for our protection, no harm that He does not lovingly allow can pass the fortress portal and get to us. He Himself is our refuge and strength, a very present help in trouble. The tiny birds found a safe haven of protection. Have you? The Lord of Angel Armies is with us; The God of Jacob is our stronghold. Fly to Him.